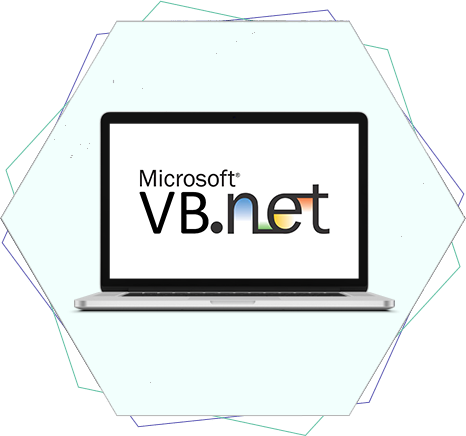 Dedicated as a VB.Net Development Company, Macshell has an experienced team of VB.NET developers, who listen to your requirements and turn them into highly functional technologies. Our development solutions have helped hundreds of businesses with strong applications. We aim for your productivity and user-friendliness when developing products. At Macshell, we adapted the VB.Net technologies at an early stage. The acquired expertise has made us a powerful development company to deliver performance-driven apps for our clients. The same experience also allows us to keep the apps aligned with clients’ business and budget as well. Your visions meet our excellent infrastructure and skilled team. Hence, you can feel confident about the performance and usefulness of VB.Net products. With you want to Hire VB.Net Dot Net Developers in India, our developers are perfect to obtain the renowned benefits of VB.Net. We have e-commerce development experts who can meet your business needs. The knowledge of e-commerce industry is a necessity for developers. Only then, they can understand the feature trends of the market and work accordingly. Our development team stays updated with the latest e-commerce industry trends. You can rely on the recommendations and get the best-suited e-commerce app developed with us. We prepare business-oriented windows mobile apps utilizing VB.Net technology. We use the dynamic technology of VB.Net and our mobile app industry knowledge. As a result, you receive a robust Windows mobile app. Enhance your customer relationship with our CRM applications within VB.Net. Customers have hundreds of options in terms of services online. We help you with our CRM solutions to maintain a strong relationship and build customer loyalty. Our CRM solutions of VB.Net create a simple and convenient way of managing customer relationship. Our developers know how to bring functionality and ease of maintenance in a CMS. We conduct object-oriented development, which allows us to build adaptable and flexible CMS solutions for our clients. You can easily publish new content, manage published content, edit and make other required changes without any complication. According to your needs, we can develop additional apps for MS-Office. VB.Net development approach makes efficient development possible. Our experts leverage the language to create business-oriented additional apps for your MS-Office. With that, you can improve the productivity in your company. We specialize in the development of client or server apps. Get your business server apps to enhance work culture and reduce daily stress for your internal team. We develop highly secure applications for your server. The proficiency and cost-effectiveness will resolve all your concerns regarding the app development. We also have our support team to answer all your queries regarding server apps.